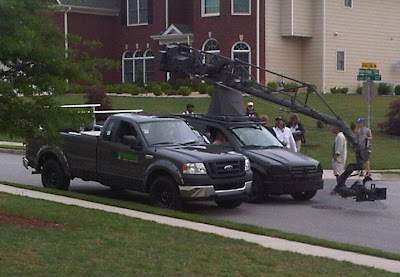 Buford Betty: Film crew in the 'burbs. Film crew in the 'burbs. Craziness on our street all day today! I thought they were just outside our house, but they are ALL up and down our street with cops on either end blocking off cars. The hub of course was chattin' it up with one of the production assistants and learned that there are like 40 movies being filmed in Atlanta this year... apparently the state gov gives some kind of refund or assistance on production costs spent in the state. Very cool. Very cool! George Clooney just finished filming here in St. Louis and they say it always brings in tons of jobs and revenue to where ever they film. Too cool. We had Sandra Bullock, Kathy Bates and Tim McGraw filming at a rug gallery right next to my shop on Miami Circle a couple weeks ago. But I didn't get a glimpse of any action or any famous person. I think they entered through a side entrance and I think they filmed a lot after 6pm. All I saw was a lighting truck around noon. The movie is called "The Blind Side" and I think it's a football theme. Very cool! Do you know if there is a list of the 40 movies being filmed? I'd love to catch a little bit. I missed Sandra Bullock, who was filming outside my office in Midtown! Up eating cereal at 4:45am? That'd be me. Oh yeah, it's Cinco de Mayo! Shecky's Tickets - Last Chance!